EXTREMELY FINE GEM. 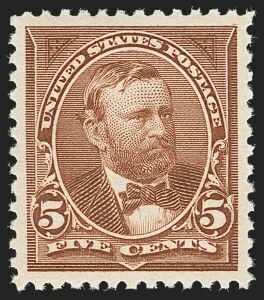 A SPECTACULAR MINT NEVER-HINGED EXAMPLE OF THE ONE-CENT 1894 UNWATERMARKED BUREAU ISSUE, GRADED SUPERB 98 JUMBO BY P.S.E. -- THIS IS THE HIGHEST GRADE AWARDED. 1c Blue (247). Mint N.H. with top plate no. 102 selvage, deep rich color and sharp proof-like impression, choice centering with huge margins all around, Extremely Fine Gem, ex "Scarsdale" -- this stamp has contradictory certification history; when offered in our "Scarsdale" sale (Sale 924, lot 73) it had 1987 and 2000 P.F. certificates as Mint N.H. and a 2004 P.S.E. 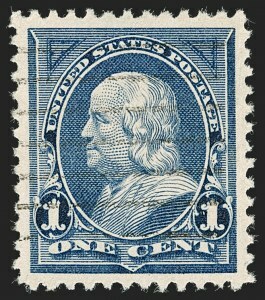 certificate as Mint N.H. (XF-Superb 95 Jumbo), the older P.F. certificates no longer accompany and it now has a 2018 P.F. certificate as Mint N.H. (XF 90 XQ), the 2004 P.S.E. certificate also no longer accompanies and it now has a 2010 P.S.E. certificate as hinged (OGph, XF-Superb 95), but we and the P.F. see no trace whatsoever of hinging -- Scott Retail as Mint N.H. EXTREMELY FINE GEM. 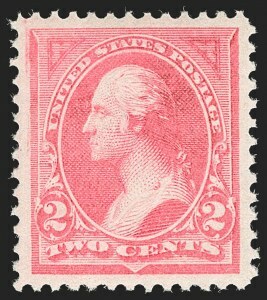 A BEAUTIFUL MINT NEVER-HINGED EXAMPLE OF THE 1894 2-CENT TYPE I BUREAU ISSUE IN THE PINK SHADE, GRADED SUPERB 98 BY P.S.E. EXTREMELY FINE GEM. 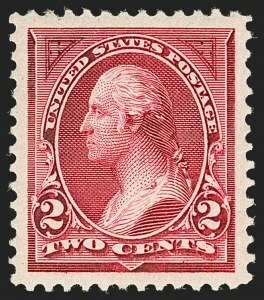 A SPECTACULAR ONE-OF-A-KIND MINT NEVER-HINGED EXAMPLE OF THE UNWATERMARKED 2-CENT TYPE I 1894 ISSUE IN THE CARMINE LAKE SHADE. 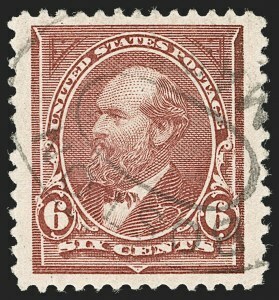 THIS MAGNIFICENT STAMP HAS BEEN AWARDED THE GRADE OF GEM 100 JUMBO BY P.S.E. -- IT IS THE ONLY EXAMPLE TO ACHIEVE THIS ULTIMATE GRADE. 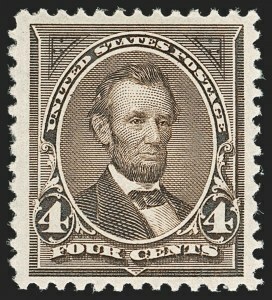 As collectors of the First Bureau Issue know, great difficulty was experienced in perforating the stamps, either due to poor equipment or improper operation. 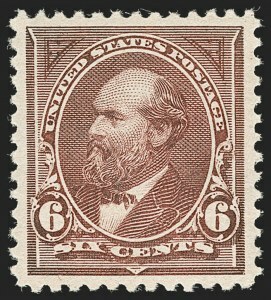 Choppy, ragged perfs and poor centering are so common on this issue that it is often possible to separate the 1894 unwatermarked stamps from the 1895 watermarked stamps by the appearance of the perforations alone. 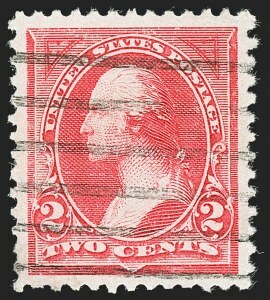 This example, with precise centering, Jumbo margins and perfectly formed perforations is an extreme condition rarity. EXTREMELY FINE GEM. 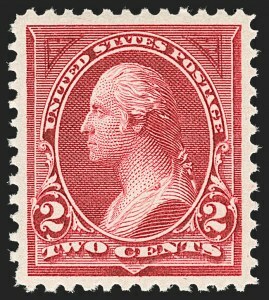 A SUPERB MINT NEVER-HINGED EXAMPLE OF THE 1894 2-CENT CARMINE TYPE III BUREAU ISSUE. EXTREMELY FINE GEM. THIS IS THE FINEST EXAMPLE OF THE UNWATERMARKED 1894 3-CENT BUREAU ISSUE RECORDED. A SPECTACULAR STAMP IN EVERY RESPECT, GRADED SUPERB 98 BY P.S.E. 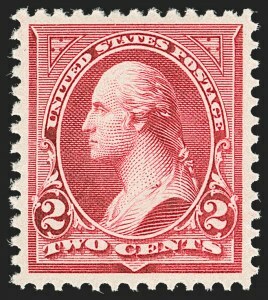 As collectors of the First Bureau Issue know, great difficulty was experienced in perforating the stamps, either due to poor equipment or improper operation. 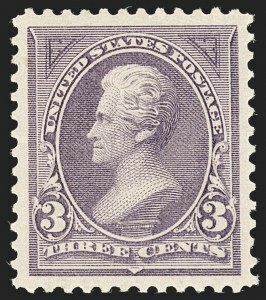 Choppy, ragged perfs and poor centering are so common on this issue that it is often possible to separate the 1894 unwatermarked stamps from the 1895 watermarked stamps by the appearance of the perforations alone. 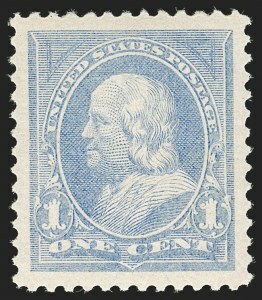 This example, with precise centering, wide margins and perfectly formed perforations, is a true condition rarity. EXTREMELY FINE GEM. THIS MINT NEVER-HINGED EXAMPLE OF THE 1894 5-CENT UNWATERMARKED BUREAU ISSUE IS THE ESSENCE OF PERFECTION. IT HAS BEEN GRADED SUPERB 98 BY P.S.E., WHICH IS THE HIGHEST GRADED AWARDED. 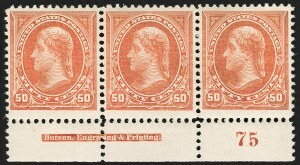 According to Brookman, certain abrasive components of the ink used for printing the 5c stamp caused rapid plate wear. The stamp offered here, with such a remarkably detailed impression, in pristine condition and with superb centering, is truly the finest we have ever offered. With 1990 and 2004 P.F. and 2005 P.S.E. certificates (XF-Superb 95; SMQ $2,900.00). Only three have graded higher (one at 95J, two at 98). With 1996 P.F. and 2005 P.S.E. certificates (Superb 98; SMQ $11,000.00). Only one other has achieved this exalted grade, which is the highest awarded.